KIEV, Ukraine -- Case of Vladimir Rybak is latest in a string of kidnappings which Kiev blames on Russia and its undercover agents. 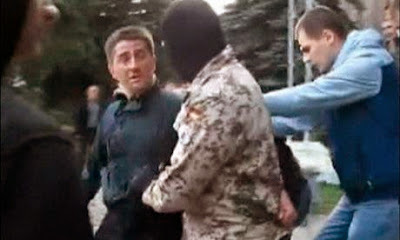 Vladmir Rybak (L), is manhandled by several men outside a city hall building in Horlovka on Thursday 17 April. The last time Vladimir Rybak was seen alive was on Thursday 17 April. The local councillor was walking away from the city hall in the eastern Ukrainian city of Horlovka after taking part in a pro-Ukrainian flashmob in the central square. Three days earlier, separatists had seized the government building, taking down the Ukrainian flag and replacing it with the tricolour of the Donetsk People's Republic. According to friends, Rybak, who was 42, made no secret of his strong anti-separatist views. "He was entirely open – and at times impulsive," fellow councillor Yurii Zhuk said. After the demonstration Rybak tried to barge his way into the Horlovka city hall and take down the rebel flag. A video captured what happened next. Pro-Russian protesters jostled Rybak; they refused to let him inside; a youth in a balaclava grabbed his arm and led him away. Zhuk said that Rybak and a friend then left the square, tracking away from its Lenin statue, and headed towards the city's Palace of Culture. A KIA car pulled up, and four men in masks and military fatigues jumped out and grabbed him. Rybak's friends assume the kidnappers must have had a gun. "Vladimir was a sportsman and an ex-policeman. He knew how to handle himself," Zhuk said. Over the weekend, Rybak's battered body was found in a river near the separatist stronghold of Slavyansk, 60 miles away. According to investigators, he had been tortured. There were stab marks on his stomach and bruising on his chest. Rybak's kidnappers tied a sandbag to his body and drowned him while he was unconscious. On Wednesday, his widow Elena, a 49-year-old doctor, and 25-year-old son Yura, went to Slavyansk to retrieve his body. The gruesome case is the latest in a string of kidnappings and murders in eastern Ukraine which Kiev blames on Russia and its undercover agents. Law and order in Slavyansk and surrounding areas of the Donetsk region has deteriorated dramatically. In Kramatorsk, pro-Russian gunmen hijacked the security agency HQ. They also beat up the city's deputy mayor and kidnapped its police chief – both supporters of Ukrainian unity. The situation in Slavyansk, the separatists' fortified capital, appears to be one of gun rule. Pro-Russian militias continue to hold an American journalist, Simon Ostrovsky, taken hostage early on Tuesday, as well as several Ukrainian reporters including Irma Krat. The gunmen have threatened western correspondents, evicted Roma families from their homes and apparently imprisoned the local mayor. Vyacheslav Ponomaryov, the "people's mayor" of Slavyansk said that Ostrovsky wasn't a hostage as such but was being "held" by his militia. He described the journalist as a "provocateur" and berated the media for not reporting on the fate of pro-Russian activists arrested by Kiev for separatism. The mayor gave no indication of when Ostrovsky might be released. He said he was being kept in good conditions, with enough to eat, and the opportunity to wash. In the past week, 16 people have been kidnapped in Slavyansk and Horlovka, and two murdered, including Rybak. Rybak was a deputy for the Batkivshchyna party of Ukraine's acting president, Olexsander Turchynov, who announced on Tuesday that Kiev would now restart military operations against pro-Russian separatists in the east. The body of a second party supporter, unidentified, was found near Rybak's. Both had been tortured to death, Turchynov said. "The terrorists who effectively took the whole Donetsk region hostage have now gone too far, by starting to torture and murder Ukrainian patriots. These crimes are being committed with the full support and connivance of the Russian Federation," he said on Tuesday. There were few signs of an offensive on Wednesday, however. Ukraine's interior ministry claimed it had flushed gunmen out of a small town called Svyatohorsk, just outside Slavyansk, but there had been no previous reports of gunmen in the town. That ended in humiliating failure when well-organised pro-Russian gunmen captured six Ukrainian armoured vehicles sent to Kramatorsk, 10 miles from Slavyansk. Either way, it is clear that the international deal to defuse the crisis, agreed last week in Geneva, is dead and buried. The EU called on Russia on Wednesday to ensure an immediate end to the kidnappings and killings in eastern Ukraine. But Russia's foreign minister, Sergei Lavrov, accused Kiev of violating the Geneva statement, and warned that Russia would respond if its interests were attacked in Ukraine. Lavrov used an interview with the Russian state-controlled broadcaster RT to accuse the US of "running the show" in Ukraine, saying it was quite telling that Kiev announced a new military campaign immediately after a visit by the US vice-president, Joe Biden. "If we are attacked, we would certainly respond," said Lavrov, who recalled the 2008 war with Georgia over breakaway South Ossetia. In the capital, Kiev, Ukraine's SBU security service revealed details of Russia's alleged role in Rybak's abduction and murder. Officials named two Russian agents as the masterminds behind special operations in the east of Ukraine. Both agents work for Moscow's GRU military intelligence wing, the officials said. Zhuk said he last saw Rybak in Horlovka's central square half an hour before his abduction. They had agreed to meet at 10am the next day. "That someone can be kidnapped in 2014 in the centre of Europe is terrible. I don't have words," he said. "Radical elements who exist in the city. The fact that he was found in Slavyansk confirms this was the work of separatists." According to Zhuk, the majority of Horlovka – a mining and industrial city of 275,000 people – do not support the separatists' cause. But he said Russian television had had a brainwashing effect, with many people now unable to tell "what was true and what a lie". He stressed: "The big majority are peaceful." Zhuk described calls for an anti-Kiev referendum on 11 May as completely absurd, saying: "There is no legal basis for it." He is one of three representatives in the 75-seat city assembly for the Europe party. The police had done little to halt the breakdown in public order, he said. "They are demoralised, and split into two halves: one group supports the Donetsk People's Republic, the other Ukrainian unity." "There's no unified leadership. Nor are there any clear orders from Kiev." Rybak was elected to Horlovka's city council in October 2010. A father of two, he had previously worked as a detective, heading up the investigations unit. Another councillor – Oleh Hurbanov, an independent – said he had disagreed with Rybak over many topics, but respected him for his forthright views. "I absolutely condemn the people who did this. Everybody has a right to life," Hurbanov said. "I want a united Ukraine. But we've left [the flag] up there for now to try and avoid conflict," Vasily Mirozhnik, head of public affairs, explained. Who was behind Rybak's murder? "It's a riddle," he said.